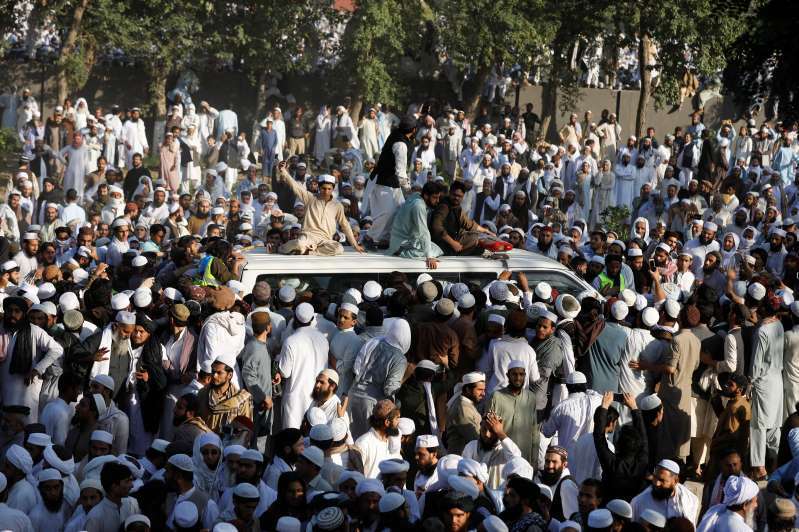 © Faisal Mahmood/Reuters Mourners at the funeral of Muslim cleric Sami ul-Haq in Akora Khattak, Pakistan, on Nov. 3, 2018. A delegation of Afghan leaders came to pay their respects to Haq, whom the Kabul government had recently asked to help persuade Taliban insurgent leaders to begin negotiations for an end to the 17-year war. He was a radical Islamist scholar — often called by the title of respect, maulana. But he was also a respected political leader and legislator, and a humanitarian who famously issued a religious fatwa condemning Islamist militants for attacking health workers distributing the polio vaccine. The signed deal, made public immediately, allowed the anti-blasphemy groups to appeal the Supreme Court ruling. It also agreed that Bibi, whom the protesters want dead, will not be allowed to leave the country. While many Pakistanis expressed relief that relative calm had returned after days of unrest, the stunning capitulation drew widespread condemnation Saturday. Many critics called it a dangerous surrender to the forces of religious extremism and hatred against minorities, who are often targeted on trumped-up charges of blasphemy against Islam. Bibi, 47, a peasant worker, was convicted after an argument with Muslim co-workers in a field. The high court ruled that the evidence against her was flimsy and contradictory, but it did not criticize or question the strict blasphemy laws or the mandatory death sentence for those convicted. Some warned that Bibi’s life is not safe in Pakistan, where people accused of blasphemy are often lynched. Her lawyer fled the country Saturday, saying he had received death threats. The justices who freed Bibi have had their lives threatened, so another high court panel that hears the protesters’ appeal may also feel in danger.